The story of Amba, Ambalika and Bhishma from Mahabharata is well known. 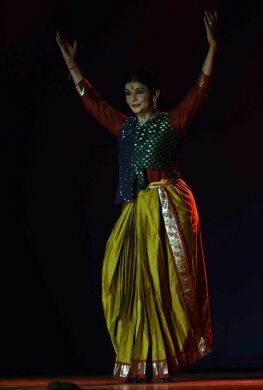 Shila spent a month learning the story, its implications, how to incorporate several elements into Kathak format and finally choreographed it as a solo Kathak. The title Nimitta was chosen as refusal of Amba by Bhishma resulted into revenge and became the cause, Nimitta, for Bhishma’s death. 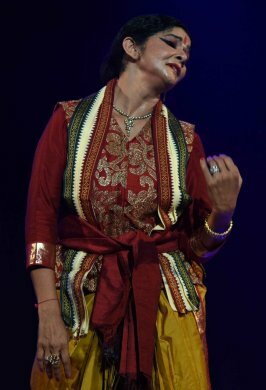 Shila developed the theme taking assistance from her musicians and also Charani ballad singer for the text to use in the production. That worked well for choreography, as earlier also Shila had employed Charani ballad singing and text for her other Kathak productions. It suited perfectly as it describes war and how the fight between Arjuna and Bhishma results in shower of arrows on either side. As Shikhandi dressed in a specially designed costume, with North Indian jacket and a ghaghara (skirt) with Benarasi sari and border, and in one ear a kundal, on the arm a bangle and one side of dupatta to suggest female, and the other side bereft of ornaments to suggest male aspect. In order to depict combined male, female elements the costumes suited the character of Shikhandi. Shila also walked in with a typical feminine movement. Creating the Kalachakra, the cycle of time when the Kurukshetra war takes place, Shila used forceful movements of arms in circular fashion with her back to the audience. The narration in Hindi establishes the context of war. The shloka in Sanskrit with blowing of the conch, the armies on both sides marching, the vultures flying, horses, elephants, chariots moving create the scene of war field, using the mnemonic syllables takit dhikit, takit dhikit, and the Charni singing describing the shooting of arrows makes one almost feel that the war is on. Bam bam, Rudra banam, banam sasi sit maha banam, megh banam, zala managala, pavanam, jala banam, bija banam, Vajra banam enumerating various types of arrows in its nature of ferocity like Rudra, big, invoking rain, wind, water and thunderbolt, the war is on, the sky is all aflame and resounds, fight, fight, and with such recitation on both sides the arrows are let loose. The sutradhara announces that in the balance of dharma and adharma, time (kaal) was declaring that there was no fear of death. Arjuna moves his chariot towards the army of Kauravas, and saw before him Bhishma standing addressing Shikhandi to tell Arjuna that he can shoot as many arrows as he wants to, Bhishma shall never attack a woman. The unbearable pain in chest of Shikhandi turns into flashback. As Amba, the princess, she has all the grace in the world, her ornaments, garments, anklets, bangles, enhance her feminine beauty. Using the ghunghat ke gat, husna ki gat, bindi ki gat, and walking gracefully as Amba, Shila evoked her royal demeanor. 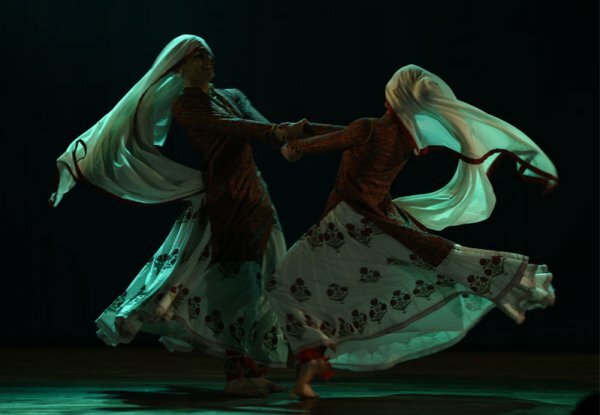 The characteristic gat bhava and gat nikas of Kathak were used artistically. With garland, Amba proceeds to her beloved Salva, who rejects her and taunts her that she has been with Bhishma, and he would not marry her. Go to Bhishma. A tearful Amba with folded hands begs of Bhishma to accept her, but he as a celibate does not relent. In what a state I am, cries Amba. She entreats him: Araj hai mori, karo na jora jori, Salva ko pati rupa me dekha, mai kaise naya byaha rachau? (I have seen Salva as my husband, and now how can I have another marriage? O Bhishma, put sindur on my head.) 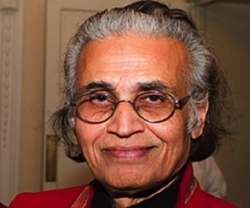 But Bhishma is steadfast in his decision. At this injustice, Shikhandi wows to fight him in battle taking the birth as Shikhandi. Bhishma announces that he will not attack a woman, Shikhandi laughs at that and tells him that she is of third gender and asks Arjuna to kill Bhishma. The cry of Shikhandi tears the sky. As napunsaka, neither woman nor man, Shikhandi cries and laments that she/he is Nimitta, a mere cause for the death of Bhishma, and prays to Lord Shiva that ultimately only he will rescue her when she goes unto him. The lament of Shikhandi ends with the blowing of conch and darkness descends upon stage. As a solo it has been powerfully choreographed and in both phases of Amba and Shikhandi, Shila succeeds in portraying them distinctly. The pain lingers long in story of Shikhandi as third gender. With little tightening and recorded music, this production needs to be seen in other cities. The collaborative attempt of a senior dancer like Kanak Rele and her guidance to much younger dancer augurs well. Kathak dance form thus finds an extra dimension. Following the solo presentation was group dances by the students. From tiny tots to senior dancers, their exposition showed the range of Kathak, the ability to master the technique and Shila’s hard work over the years. The various students of different levels performed old compositions. The kavits, Hori, Rasaleela, tarana, were rendered with zest. Compositions of Bindadin Maharaj like Sab ban than aiyi pyari re, Chandrabandan, and Mriganayani odhi nayi sari re evoked memories of early 70s when these songs were popular. The dancers danced with suggestive abhinaya describing colourful saris, their faces like moon and eyes like those of deer, the garlands of pearls, the curly hair, the faces shining like lightning and their seductive gaits ‘mukha damini si chamakta, chaal matawari’ were sung in melodious tunes. The songs for Rasaleela enacting playing of drums, flute, been, mridang and humming sweet tunes, the Gopis move in circle in a joyous dance. The three Belgian dancers performed Rajasthani Ghummar dance with such perfection and lilt that the audience lustily cheered their efforts to learn folk dances besides Kathak. In Teratali, dancers keep taal by playing on small cymbals striking them in unison to the rhythm. They danced spiritedly and won appreciation of the audience.